Tower Bridge is one of the great iconic structures that London has to offer. Built during the affluent Victorian period following the industrial revolution, Tower Bridge also finely represents the ‘can do’ attitude and cutting edge engineering skills that Britain had to offer at that time. A Special Bridge or Subway Committee was formed in 1876, chaired by Sir Albert Joseph Altman, to find a solution to the river crossing problem. It opened the design of the crossing to public competition. Over 50 designs were submitted, including one from civil engineer Sir Joseph Bazalgette. The evaluation of the designs was surrounded by controversy, and it wasn’t until 1884 that a design submitted by Sir Horace Jones, the City Architect (who was also one of the judges), was approved. The bridge is 800 feet in length with two towers each 213 feet high, built on piers. The central span of 200 feet between the towers is split into two equal bascules or leaves, which can be raised to an angle of 83 degrees to allow river traffic to pass. The bascules, weighing over 1,000 tons each, are counterbalanced to minimise the force required and allow the bascules to be raised in a relatively speedy five minutes. The two side-spans are suspension bridges, each 270 feet long, with the suspension rods anchored both at the abutments and through rods contained within the bridge's upper walkways. The pedestrian walkways are 143 feet above the river at high tide. Jones died in 1887 and George D. Stevenson took over the project. 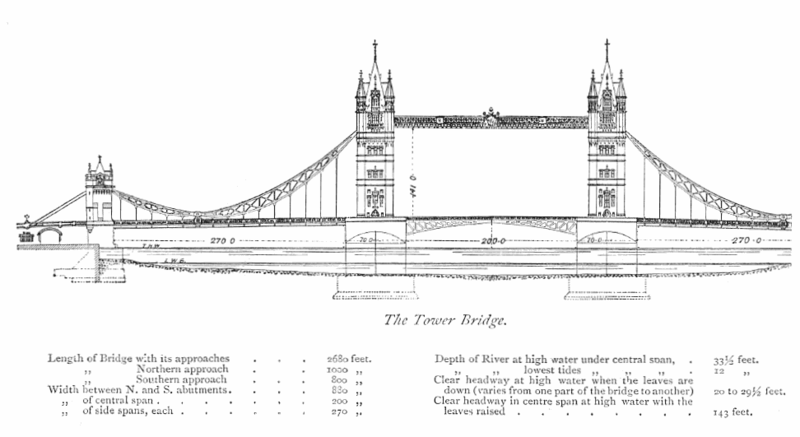 Stevenson replaced Jones's original brick façade with the more ornate Victorian Gothic style, which makes the bridge a distinctive landmark, and was intended to harmonise the bridge with the nearby Tower of London. The bridge was officially opened on 30 June 1894 by The Prince of Wales (the future King Edward VII), and his wife, The Princess of Wales (Alexandra of Denmark). 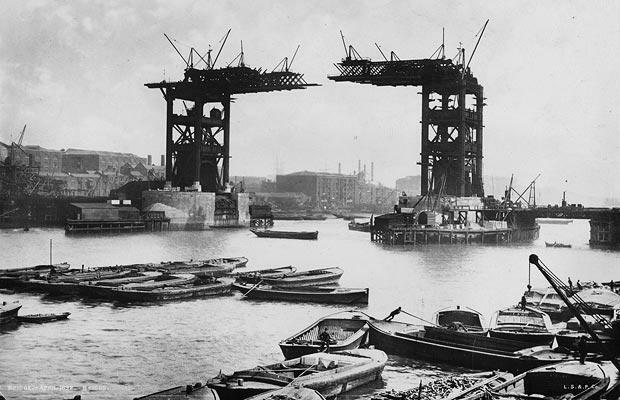 Once opened, the bridge connected Iron Gate, on the north bank of the river, with Horselydown Lane, on the south – now known as Tower Bridge Approach and Tower Bridge Road, respectively. 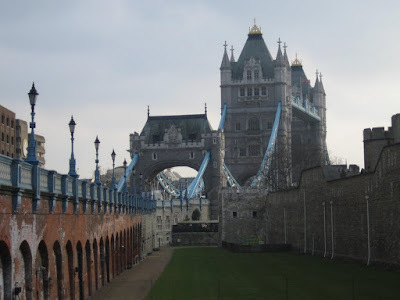 As majestic as it is, Tower Bridge also boasts a more seedy history. During the beginning of the 1900’s the high-level open air walkways between the towers gained an unpleasant reputation as a haunt for prostitutes and pickpockets. These walkways were seldom used by regular pedestrians, as they were only accessible by flights of stairs and were closed in 1910. In 1982 these flights of stairs were reopened as part of the Tower Bridge Exhibition. 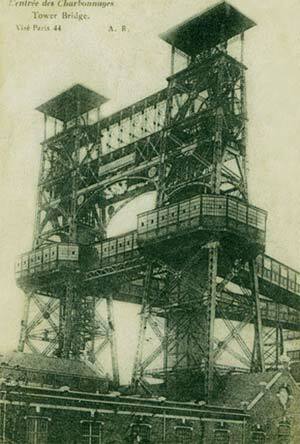 This exhibition is now housed in the bridge's twin towers, the high-level walkways and the Victorian engine rooms. 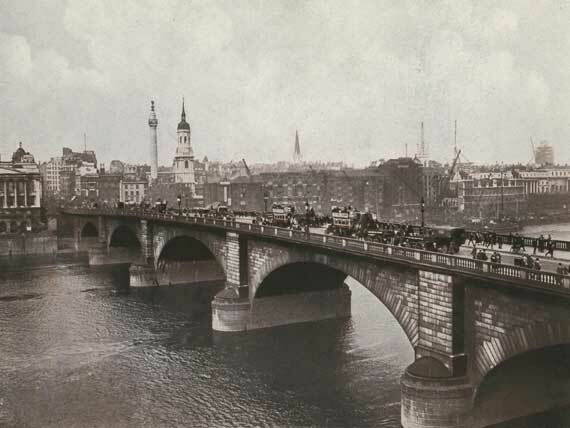 In the second half of the 19th century, increased commercial development in the East End of London led to a requirement for a new river crossing downstream of London Bridge. 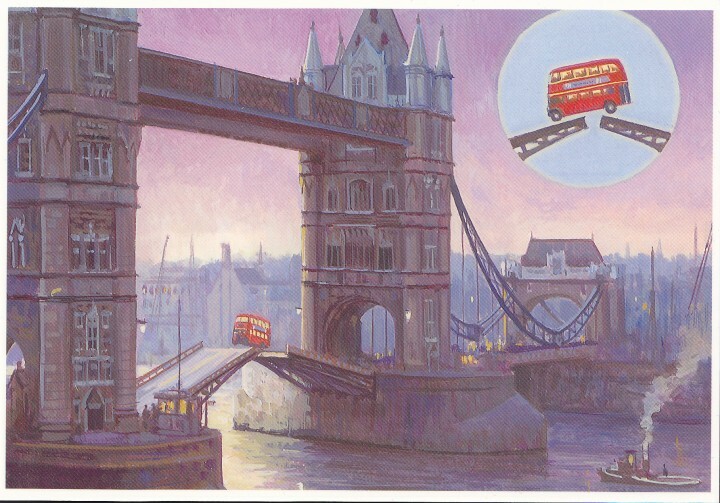 A traditional fixed bridge could not be built because it would cut off access by tall-masted ships to the port facilities in the so called ‘Pool of London’ – the area between London Bridge and the Tower of London. In December 1952, the bridge opened while a number 78 double-decker bus (stock number RT 793, registration plate JXC 156) was crossing from the south bank. During this period of the bridges history, the gateman would ring a warning bell and close the gates when the bridge was clear before the watchman ordered the lift. Unfortunately, this routine process failed while a relief watchman was on duty. The bus was near the edge of the south bascule when it started to rise; driver Albert Gunter (possibly Gunton) made a split-second decision to accelerate, clearing a 3 ft gap to drop 6 ft onto the north bascule, which had not yet started to rise. There were no serious injuries. On 5 April 1968, a Royal Air Force Hawker Hunter FGA.9 jet fighter from No. 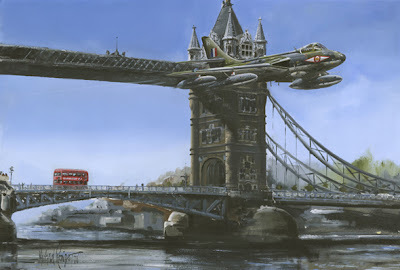 1 Squadron flew through Tower Bridge piloted by Flt Lt Alan Pollock. Unimpressed that senior staff were not going to celebrate the RAF's 50th birthday with an authorised fly-past, Pollock decided to do something himself. Without the RAF’s permission, Pollock flew the Hunter at low altitude down the Thames, past the Houses of Parliament, and continued on towards Tower Bridge. He flew the Hunter beneath the bridge's walkway, remarking later that it was an afterthought when he saw the bridge looming ahead of him. Pollock was placed under arrest upon landing, and discharged from the RAF on medical grounds without the chance to defend himself at a court martial. Tower Bridge is often mistakenly called London Bridge; however the true London Bridge is in fact the next bridge up river. Be that as it may, there is a popular urban legend that relates to this very case of ‘mistaken identity’. 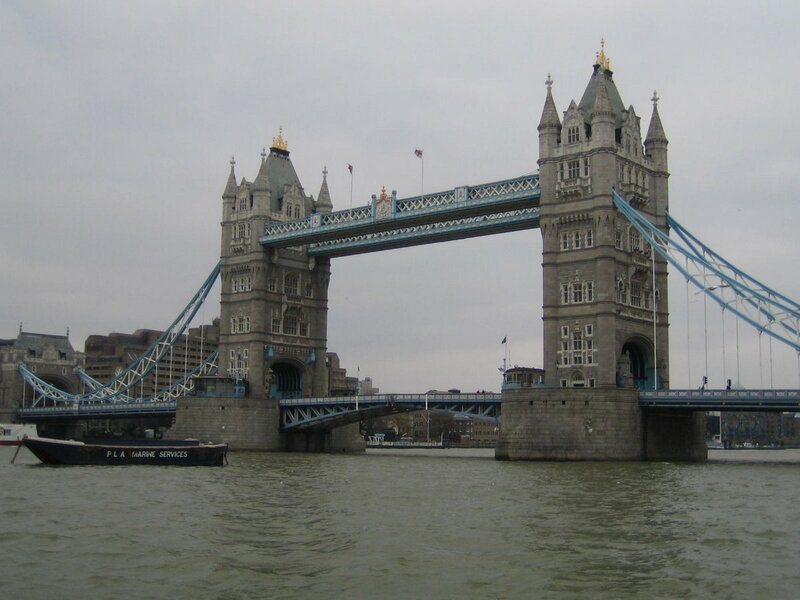 It is said that in 1968, Robert McCulloch - the purchaser of the old London Bridge that was later shipped to Lake Havasu City, Arizona - believed that he was actually buying Tower Bridge. This was denied by McCulloch himself and was later debunked by the vendor of the bridge - Ivan Luckin. Sounds a bit fishy to me, but what do you think?